On the occasion of the Policy Forum of Mobile Learning Week, the Minister of Education of Honduras, Marlon Oniel Escoto Valerio, held a bilateral meeting with the Director-General Irina Bokova at the Organization’s headquarters. 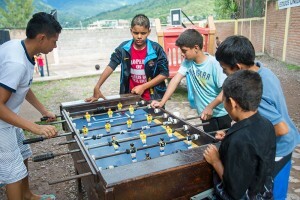 Youth outreach centers provide entertainment and recreation in addition to education. Minister Escoto thanked UNESCO for the fruitful cooperation between his country and the Organization. He affirmed that universal pre-school education and literacy’ were among the Ministry’s top priorities. While there has been a significant expansion since1999 in pre-primary enrolment the aim is to universalize it by 2017. In the area of literacy, a major drive is underway with the ambition to eradicate illiteracy by 2017. ‘The Director-General commended the Minister for the country’s educational progress and commitment, and pledged that UNESCO would continue to’accompany the Government in its ambitions to improve access, improve the quality of education and promote literacy, in line with the 2030 Agenda. The Minister also noted the fruitful meetings he had held during his visit with the Assistant Director-General for External Relations and Public Information, and with the Assistant Director-General for Education.